When it comes to window sills in general, depending on the material you use, they can be easily cut to the size window you need. If you are using a material that is considered a bit more difficult to cut like stone, this might not be so easy. In fact, it will most likely cost you a bit more money too. That’s why when you are stocking your warehouse with marble window sills, the smartest thing you could to is buy them at wholesale price. Here’s the thing: not all marble wholesale distributors are selling their material at a discounted rate. Just because they are selling them in bulk, doesn’t necessarily mean that the price is the lowest. This may be especially true when you are buying stone tile from a distributor and they’re adding in stone window sills as a secondary sell. The best way to ensure that you are getting the best price on stone window sills is to find a wholesale distributor that specializes solely in natural stone window sills distribution. Where Can You Find a Natural Stone Distributor? Stonexchange, a manufacturer and wholesale distributor of marble sills and thresholds, has a quality selection of marble and travertine window sills in their South Florida warehouse. Stonexchange stocks three standard lengths of marble window sills. They are available at 36”, 56”, and 74”. The thickness of a window sill is usually 5/8”, but they can be thicker. This is where the custom sizing might come into play. 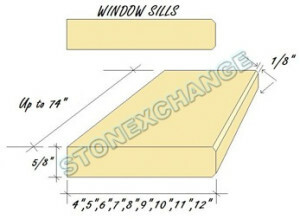 The positive advantages of stocking your stone window sills from a window sill distributor—with a warehouse, is that you can get your ordered filled at a moment’s notice and have it shipped to you in a matter of weeks, possibly even days. So it is with Stonexchange, UNLESS you are requesting a custom size. Stonexchange’s warehouse is conveniently located in Miami, Florida, the city with one of the largest ports to easily receive custom shipments of fine custom marble and travertine window wills from overseas. While Stonexchange readily has on hand the three standard lengths in select colors that will complement almost any décor, we also have the capability to manufacture any size window sill of your choice. However, custom window sill orders will need to be cut at our quarry overseas, so you’ll need to allow at least 10 weeks of lead time. This is an important note for designers and architects who craft specialized building structures. It can often get pricey when it comes to buying natural stone window sills that match your flooring. Most designers might want to do this for a aesthetic look. This is because in a sense, if you want your window sill to match the exact flooring you have, you’re kind of getting a custom cut right there. You don’t necessarily have to match your natural stone window sills with the rest of your flooring, especially if you’re trying to save money. In fact, selecting a window sill that actually contracts your floors might offer a bolder look and even create a signature design for a construction company. Builders have been known to pair marble and travertine window sills with different kinds of material that complemented each other nicely. Natural stone window sills will not wear, fade, or deteriorate, and is pest resistant. It’s also waterproof, so you can ensure buyers that they can cross off window sill replacements when it comes to maintaining their building structure. Why Would You Need Custom Window Sills Anyway? Some architects and designers might be building structures for custom residential housing, businesses, or even public dwellings that require a certain ‘wow’ factor. For dwellings, that usually involves a special window design. In instances like this, custom window sills are absolutely necessary. As far as the inside of a dwelling goes, this is where the interior decorators shine. Depending on the way the window is built, they can be used for multifunctional purposes. Two of the most common ways to improvise on the design of a windowsill is to replace it with a nice marble or travertine window sill. This minor change makes all the difference, creating an inviting space that could be a nice bookshelf or window seat. These days, downsizing seems to be all the rage and designers are constantly coming up with new ways to create multifunctional spaces. Natural stone window seats can be used as a desk or fold-out table and even as seating. They are narrow enough for built-in shelving, decorative vanity trays and medicine cabinets, and spice racks. For these type of heavy duty purposes, you’ll most definitely want to custom order a marble or travertine window sill. With Stonexchange, you will definitely save money on your window sill, whether it is one of the three standard sizes or a custom design. Our friendly and knowledgeable staff is on hand to offer any suggestions and answer any questions you might have about your bulk order. There is a minimum of one crate that equates to 50 to 100 units of natural stone window sills available. To get the maximum discount available, call Stonexchange at 305-731-2400 or contact us online. What is the Best Method for Installing Marble Windowsills? What Are The Most Popular Marble Threshold Sizes? How Necessary Are Window Sills In a Home? Click Here to Read Our Blog.